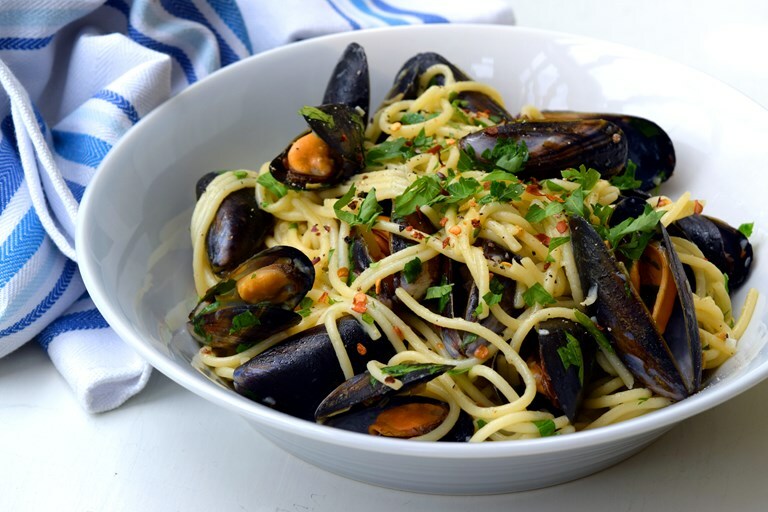 Rachel Phipps shows how to create a Mediterranean feast in minutes with her irresistible spaghetti with mussels recipe, also known as Spaghetti alle cozze in bianco. Perfect for a quick after work meal, it can served up in just 15 minutes and mainly uses store cupboard ingredients. Spaghetti alle cozze in bianco, or spaghetti with mussels without tomatoes, is probably the easiest and cheapest way to eat shellfish with pasta. You'll probably already have most of the ingredients you'll need, so all you have to do is pick up some fresh mussels on the way home. It is a dish typical of the Campania region around Naples, but in truth some version of this is eaten all the way up and down the Italian coast. I find spaghetti works particularly well with shellfish because unlike most other pastas, the long, thin, silky strands find their way into the shells making a satisfying and still very pretty dish. While it is great for a weeknight pasta dish for just you, it is easily multiplied to feed a crowd, either for something a bit different by way of a family meal, or for an alfresco dinner party served with a cold bottle or two of white wine and a richer dessert like an Italian custard (zabaione) or a chocolate mousse. While mussels are the easiest to get hold of because you can find them at most fishmongers in season, and on most supermarket fish counters all year around, any other clam-like shellfish would work perfectly here. 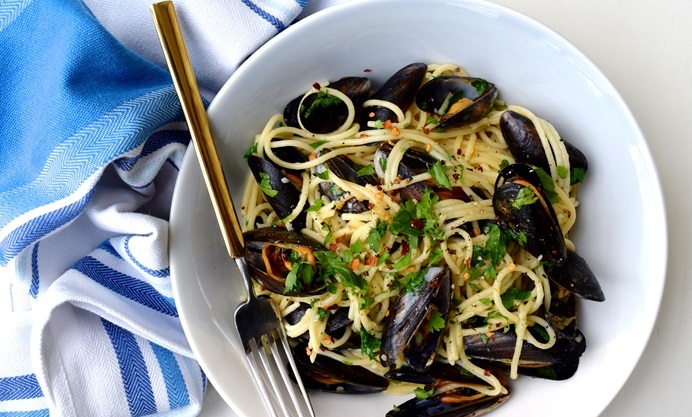 If you’re planning on serving this with white or rose wine you can add a splash of it when you’re reducing the liquor from the mussels, and to save getting garlic-scented fingers while you’re chopping you can use a simple garlic oil to finish the pasta, skipping the first step.